Over the last several weeks I finished several new cars for the layout and re-weathered an old favorite. The first car is an Accurail 50' pludoor boxcar that received light weathering as it's meant to depict a fairly new car in 1976. I used the photo below for reference in addition to several other shots that I found on the internet. I'd give credit for the photograph, but I can't remember what site it came from. The car was weathered using artist's acrylics, gouache and Windex. The roof to the kit is a separate piece and the edges of the roof are painted the same silver color as the roof itself. The edges of the roof are too thick and stand out when compared to photos of the prototype. To hide this, I masked the edges and sprayed them with a custom dark rust color that I have that just happened to be almost the same color as the car sides. I used the same paint to cover the U1 wheel stencil that came on the car. The next car is a Atlantic Coast Line combination door 50' boxcar that I photographed in Cincinnati in August of 1983. Below is a scan of the original photograph. This car was completed back in the late 1980's and I think the starting point for this car may have been a Robin's Rails 50' boxcar. The car turned out fairly well, but the coloring on the sides seemed to lack depth. So I gave the car a coat of Dullcote and then added additional weathering using artist's acrylics and Windex. The roof was originally done with artist's oils and paint thinner back when I first completed the car. The next car is quickly becoming one of my favorites. I purchased this Accurail kit from Division 7 of the NMRA this past summer and made several changes, including filling in the roof walk holes and adding cut levers. I then weathered it to reflect a car that was close to retirement. According to the information supplied with the kit, the last car in this series on the V&O was retired in 1982. This car wasn't shopped after the introduction of the Appalachian Lines paint scheme in 1968 and so it still has the original, as-delivered "Ridge Runner" paint scheme. 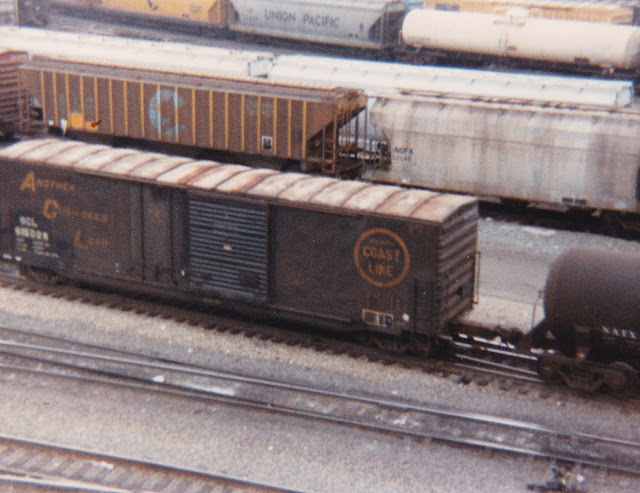 I used photographs of Great Northern boxcars painted in Great Sky Blue as references for the weathering. The color is similar to the blue on the V&O car and I was able to find several shots of similar type cars to use. I added ACI labels, consolidated lube stencils and "Keep off Roof" stencils to reflect a car in service in 1976. The last car is a woodchip hopper that was built using the recent Walthers 36' kit. The only changes made to this car was the addition of cut levers and a new woodchip load. Now that the layout is being operated on a regular basis, I'm going to need a lot more freight cars. I'm continually amazed at how quickly the layout eats cars. This past year has been one of the most enjoyable periods in model railroading that I have ever had in my life. I had the good fortune to meet a number of wonderful people in the hobby and to operate on a number of different layouts. In all, I participated in over 20 operating sessions, including 4 on my own layout. I had the priviledge of joining the Golden Lamb Affiliation, which is a round-robin group that includes Jim Rollwage and his Denver Pacific Branch of the UP, John Miller and his proto-freelanced Kanawha and Lake Erie and Bill Doll and his proto-freelanced Forest Park Southern. I accomplished more on the layout this past year than in any other year prior, and that's largely due to the great people I've met. In addition to the Golden Lamb Affiliation, I've had the pleasure of operating with and trading great coal hauling railroad information with Stuart Thayer, Anthony Hardy and Robby Vaughn. Stuart and Anthony have become regular members of the crew on the layout and we're trying to recruit Robby. These three have provided invaluable information regarding coal hoppers, tipples, and just about anything related to coal mining and railroads. And it's been a blast. All of this wouldn't have happened if Stuart Thayer hadn't made the effort to get in touch with me this past February. He was in the process of relocating to Lexington and sent me an e-mail while he was working out of Northern Kentucky. He came over to see the layout, and the rest, as they say, is history. So thank you, Stuart. It truly is a Christmas blessed, and I am very grateful for all fellowship I have enjoyed this past year. And I'm grateful for those who have taken the time to view this blog. I hope that you have found some helpful information or a little inspiration here. Merry Christmas, and best wishes for 2013! Good friend John Miller called and offered a suggestion after reviewing the post on the changes at Logan. He thought it would make more sense to have the unloader at the end of the spur with the team track location between the turnout and the unloader. This way crews wouldn't have to move a hopper that was being unloaded in order to spot a car on the team track. After taking a quick look at the area, I agreed. I wasn't completely satisified with the the overall appearance of the area as seen in the photo below. The area of the team track seemed "forced" and moving the boxcar toward the unloader would make it seem too crowded. I checked with Stuart Thayer and Anthony Hardy and they quickly agreed with John. 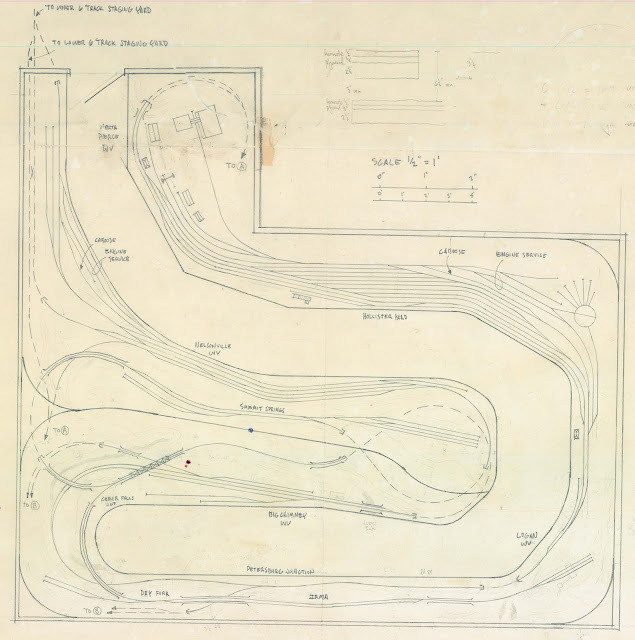 Stuart pointed out that all of the unloaders that he's seen were either at the end of a spur or on a dedicated track. So here's the new arrangement. This past weekend I finished laying the track around Logan, WV. The spur is now complete and ready to accept shipments of ammonium nitrate. The photo below shows how the track arrangement worked out, with a PRR covered hopper spotted at what will be the unloader and an N&W boxcar spotted at the team track location. The shots below show the overall area along with the new trackwork. And the two photos below show COXE 24 coming through Logan on its way to Hollister Yard at North Pierce, WV. Now I need to finish the two Intermountain F7's with Stewart chassis and Kato drives that are sitting on the work bench so I can start on scratch-building the unloader. Stuart Thayer, Anthony Hardy (who started this mess to begin with) and Robby Vaughn have sent photos of a number of unloaders and I'm anxiuos to get started on it. At the suggestion of David Lehlbach at Tangent Scale Models, I rotated the track plan and enlarged it just a bit. I don't know why I didn't think to do that in the first place! In any event, I hope this one is a little easier to read. If you haven't seen any of the Tangent Scale Models offerings yet, follow this link: http://tangentscalemodels.com/. I recently purchased the Bethlehem 70 ton riveted gondola decorated for the Lehigh Valley and it's beautiful model. More to come on this car in the near future. 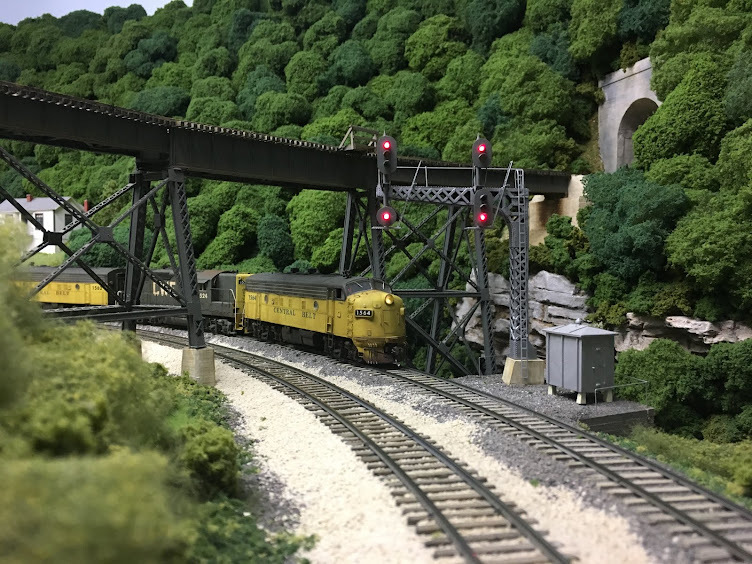 This article in the December issue of Model Railroad Hobbyist describes how I scratch-built the small truck loader at Big Chimney, WV. 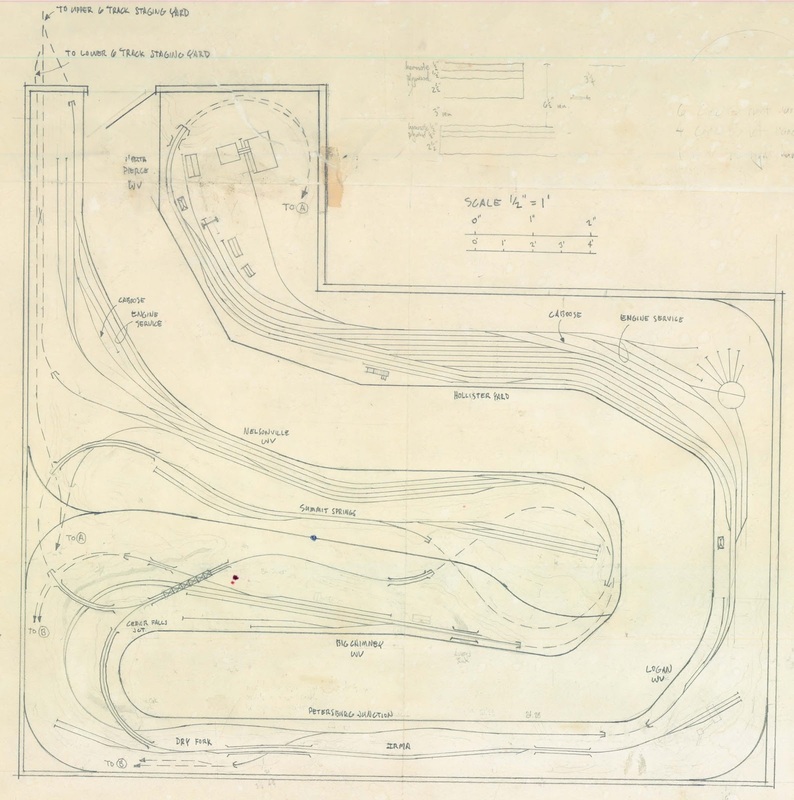 Several of the regular crew members suggested that a system map would be helpful in understanding the geographic location of the railroad and its interchanges with other roads. I had prepared one back in the early 1980's when I first developed the concept of the railroad, but was hand-drawn and fairly crude. In addition, changes have been made to several of the locations and interchanges since that first map was drawn. The map below is the first interation of the new system map, and it was done in PowerPoint. I'll make copies of these for the next operating session and have them available for the crew members. 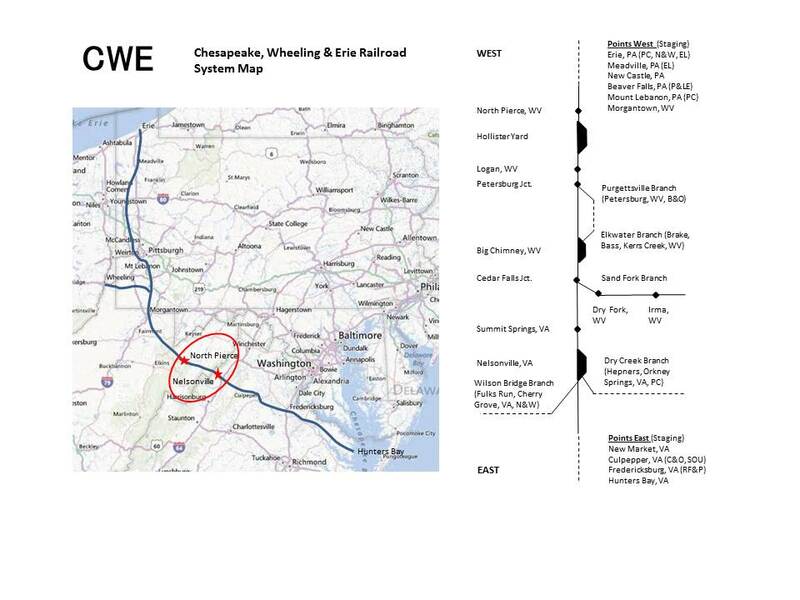 Hopefully this will help orient them to the railroad and its connections. This past week I completed the last of the hardshell scenery on the layout. I have worked my way around the layout, in a somewhat hap-hazard fashion until all that was left to do was small portion of hardshell where the Wilson Bridge Branch leaves the room and heads to staging. The photo below shows the area with first pieces of cardboard webbing in place and the tunnel portal prior to weathering. The next photo shows the entire area, including the diesel servicing facility at the east end of Nelsonville. There will be a small stream running beside the engine service facility and four bridges over the stream. I have always been a big fan of the C&O's Cane Fork Yard on the Cabin Creek Branch and this area will look very similar to that location. To line the tunnel, I used several rock casting that my Stepfather made many years ago using aluminum foil. The next step was to weather the front of the tunnel portal using artist's acrylics. Once I was reasonably happy with the results, I glued the portal in place and covered the area from just behind the face of the portal to the wall with a piece of cardboard. The rest of the webbing was then added between the fascia, the backdrop and the portal. I'll come back later and add some finishing touches to weathering on the face of the portal. In the photo above you can see the new panel I made for CX Cabin. This location controls a hidden double crossover just to the left of the picture. You can see the removable piece of styrofoam, which allows access to the turnout, in the middel of the second picture. As I got ready to complete the scenery here, I realized that crews would need to be able to track their progress from the staging yard in the other room through the double crossover. The east end staging yard now has a 6-track upper section and a 6-track lower section. Trains coming from the upper section will need to take the diverging route through the crossover to get the main to Nelsonville. I installed IRDOT infrared detectors in this area and also on the hidden wye in order to be able to know when trains were clear of the crossovers. The next step was to apply plaster impregnated gauze over the webbing and then cover it with structolite. The photo below shows the area at this point. The photo below shows the area once the base coat of green paint was applied. I plan to paint the area around the face of the tunnel portal with tan paint prior to installing the finished scenery. And the two spurs behind the branch line will serve a small truck load tipple. I'm going to wait until I have a better idea of what this area will look before I finish applying the base coat of paint. 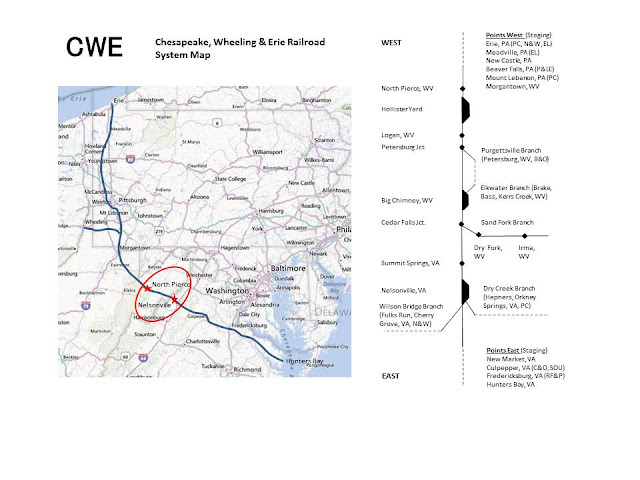 The shot below shows the recently completed section along with North Pierce, WV, which is across the isle. The area around North Pierce is the first area on the layout that was finished. It's somewhat ironic that this is also the first area that is going to be re-done. The main line here and the yard lead go into hidden staging and as I've mentioned here before, the line then heads to an unusable hidden storage yard. Also, the trees on the hillside here are from an old layout and I've found a much better way to make polyfiber trees. I attempted to replace the trees in this area but the scenery is just too deep- I can't even get to it with a creeper. Planned changes include having the hillside behind the factory extend to the wall and the stream curving out of site to the left. The yard lead will now join the main about in the center of the photo above and a single main will cross the stream. The main line will then proceed into a tunnel, through the wall and into the new 12-track staging yard that will be built in the other room. In addition to improving the scenery in this area, the new staging yard, which represents all locations west, will greatly improve the operation of the layout. I'm looking forward to seeing the first train cross the entire layout and head into the west staging yard!